After five gruelling days, the second edition of the Langkawi International Mountainbike Challenge (LIMBC) came to a close today with Germany’s Karl Platt and Switzerland’s Nathalie Schneitter clinching overall victory in the men’s elite and women’s elite categories, respectively. Platt of Team Bulls was a dominant force in his category, winning Stage 2 and Stage 4 – the king of the hill and never finished outside the top three throughout the entire event to take home the top prize, with a total cash prize of US$16,450, including US$15,000 as the overall winner. The world ranked No 7 was second on Stage 1, twice on top of the podium on Stage 2 and 4, third on Stage 3 and second on Stage 5 to clock a cumulative time of 7hrs 2:25mins. Runners-up was South Africa’s World ranked No 6, Burry Stander, of Team Specialized, who won today’s Stage 5, the 12-lap cross country 19km criterium but finished 3.45mins behind Platt, overall. Third was Italy’s Johnny Cattaneo of Full-Dynamix with a cumulative time of 7:11.04. World ranked No 8 Schneitter of Colnago Farbe Sudtirol, was unquestionably the MTB queen of Langkawi as she bagged four stage titles, with Stage 5 today as the icing on the cake. 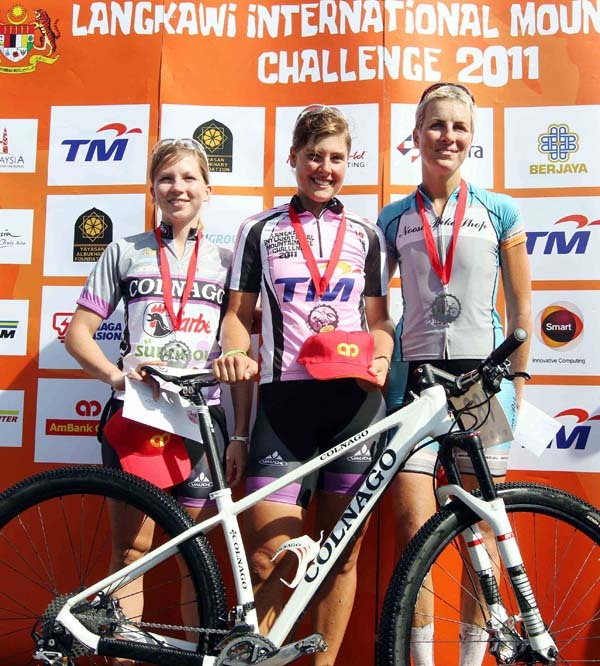 Mounting the highest podium on Stages 1, 2, 3 and 5, Schneitter’s only loss occurred on Day 4 when compatriot and team mate Vivienne Meyer reached the summit of Gunung Raya, 838m above sea level, ahead of the pack. Schneitter’s splendid performance earned her a total of US$8,610, including US$7,000 as the women’s elite top performer. In the men’s senior master, the overall winner was Craig Peacock of Australia, followed by runners-up Lieb Loots of South Africa’s Squirt and Adelaide Mountainbike Club’s John Edwin Allison. In the men’s master category, Marzio Deho of Team Olympia Italy emerged tops with a total time of 6:50.53, followed by Britain’s Anthony White of Canondale Mount Zoom Racing and Malcolm McLeod (R and R Sport) New Zealand. LIMBC 2011 featured five stages that began with Stage 1 on Tuesday with the 62km round island race, followed by the Olympic cross country which started and finished at Kampung Tok Senik Resort as Stage 2, Stage 3 an Olympic cross country at Telaga Harbour Park, Pantai Kok, followed by the lung-bursting 28km ride to the summit of Gunung Raya as stage 4 and culminating with the short circuit 19km criterium of 12 laps around Stadium Langkawi. The race, organised by Human Voyage Sdn Bhd, is sponsored by Telekom Malaysia Berhad and Yayasan Al-Bukhary as the race’s gold sponsors, with Sapura Group, Genting Malaysia Berhad, Perdana University, Berjaya Corporation, AmBank Group, Tenaga Nasional Berhad (TNB) and ALM Group Sdn Bhd as silver sponsors. AmBank Group is also the Official Bank. Proton Holdings Berhad is the official car sponsor. The event is supported by KTM Berhad and the Malaysian Conventions and Exhibitions Bureau (MyCEB), with Hotel Bayview Langkawi as the official hotel. Mutiara Smart Computing Sdn Bhd is the official ICT support partner. Daily highlights of LIMBC 2011 were shown over TV1 on RTM. 2 Vivienne Meyer (Sui) Colnago Farbe Sudtirol at s.t.